Sometimes it's nice to have a little more privacy when you renew your vows with your spouse. What better place than your own hotel suite, room or vacation rental? With all of our indoor renewals in the past, it has been a surprise gift and the reactions have been nothing short of amazing! The combination of walking into a room and finding something you didn't expect, the ceremony decor and the room design (which can be ready just after the ceremony or when you return from dinner), makes for quite a memorable anniversary gift! 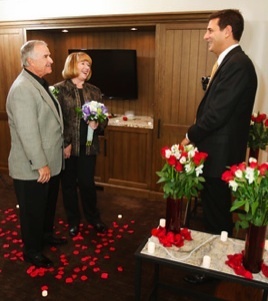 A custom written wedding ceremony by our award-winning Wedding Officiant. Package rate is $1,295 (plus the cost of the hotel room). We will assist you in finding the perfect place to stay and hold the ceremony (typically a one bedroom suite).You can also book items ala carte (e.g. not doing the room decoration afterwards or not having a bridal bouquet). Our goal is to provide you with the exact ceremony that you want!